HENRY ROLLINS: KEEP TALKING, PAL FEBRUARY 12, 2019. Comedy Dynamics will release Henry Rollins: Keep Talking, Palon February 12, 2019 on iTunes, Google Play, Amazon, Microsoft Xbox, Vudu, Spectrum and Dish Network. 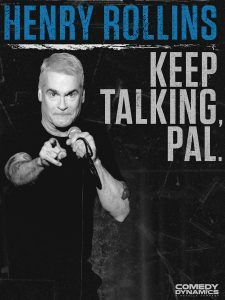 Comedy Dynamics will release Henry Rollins: Keep Talking, Pal on February 12, 2019 on iTunes, Google Play, Amazon, Microsoft Xbox, Vudu, Spectrum and Dish Network. Henry Rollins fronted the California punk band Black Flag from 1981 – 1986. Following the band’s breakup, Rollins established the record label and publishing company 2.13.61 to release his spoken word albums, and formed the Rollins Band.Since Black Flag disbanded, Rollins has hosted numerous radio shows, such as Harmony in My Head on Indie 103, and television shows such as The Henry Rollins Show, H2’s 10 Things You Don’t Know About and MTV’s Jackass. He had recurring dramatic roles in the second season of Sons of Anarchy, in the final seasons of the animated series The legend of Korra as Zaheer, amongst roles in many other films. Henry also hosts a weekly radio show on 88.9 FM KCRW. “The former punk’s wordplay hurtles across countless subjects as he delivers self-deprecating comedy and walloping home truths in this spoken-word marathon” – said TheGuardian.com. “Henry has a serious gift when it comes to storytelling. His tales captivate us, make us laugh and most importantly, they give a wonderful insight into the mind of this artistic chameleon of pop culture.” said Brian Volk-Weiss, CEO of Comedy Dynamics.